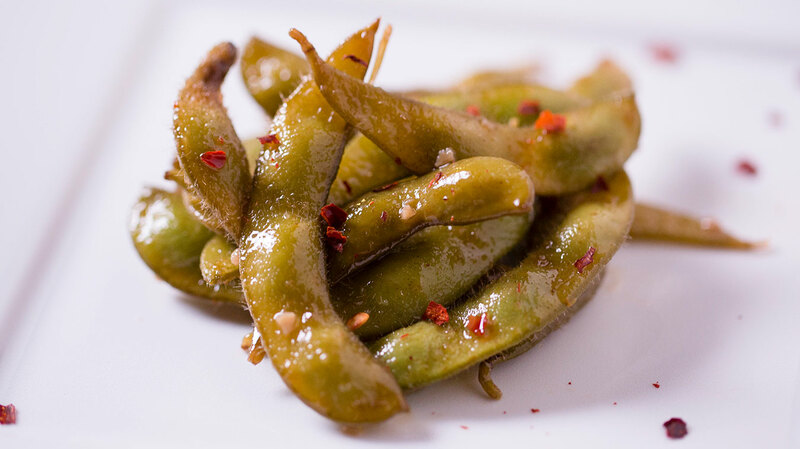 Edamame are a powerhouse of nutrition. Soybeans are one of the plant sources of complete protein; one cup provides at least five percent of all recommended daily nutrients except Vitamin D. Here are 3 delicious, healthy, and vegetarian recipes utilizing the versatile legume. Using a few of Amoretti’s premium ingredients, the flavors of each dish are guaranteed to make for a happy gathering! May the pods be ever in your flavor. ⅛ tsp Amoretti® Orange Zest Oil Extract O.S. Place edamame into a large pot and cover with salted water. Bring to a simmer over medium-low heat and cook until tender, about 5 minutes. Drain. Purée edamame, garlic, tahini, water, cilantro oil, lemon juice, olive oil, kosher salt, cumin, and cayenne pepper until smooth. To prepare vinaigrette: combine vinegar, garlic, and oregano. Mix with a whisk or in the blender. Slowly add olive oil and mix well. Add salt and pepper to taste. To prepare salad: combine edamame, tomatoes, onion, olives, feta and vinaigrette. Let marinate 30 minutes. When ready to serve, toss or serve salad with lettuce or greens. Bring 4 cups of water to a boil and add the edamame. Bring water back to a boil; cook for 5 minutes or until tender, drain. Heat olive oil in a large skillet over medium-high heat. Add chili flakes and crushed garlic, sauté lightly for 30 seconds. Add edamame and stir to heat through, about 2 minutes. Add soy sauce and rice wine vinegar, stir 1 minute to coat evenly and heat through. Shake the sesame oil and Orange Zest Oil Extract in a small container until well combined. Stir into the skillet until well incorporated. Transfer to plate and serve hot. Garnish with sesame seeds.